On Saturday we swam the five and a quarter mile length of Coniston, me and about 700 others. The drizzle was brightened by a procession of pink and orange tow-floats. My second time at this fantastic event, but my first without a wetsuit, and despite the rain I had a fair view, randomly choosing to swim the majority of it breaststroke having trained front crawl all summer. It kept me warm. A girl can change her mind. So for the record: 3 hours 14 minutes, 20 minutes slower than last year, but most of that is the lack of a wetsuit. Wetsuits go faster, but they’re not as much fun, not when one has a cossie with ‘some like it cold’ printed on the bum. This is near the start, on the way towards Peel Island, or Wildcat Island for fans of Swallows and Amazons. 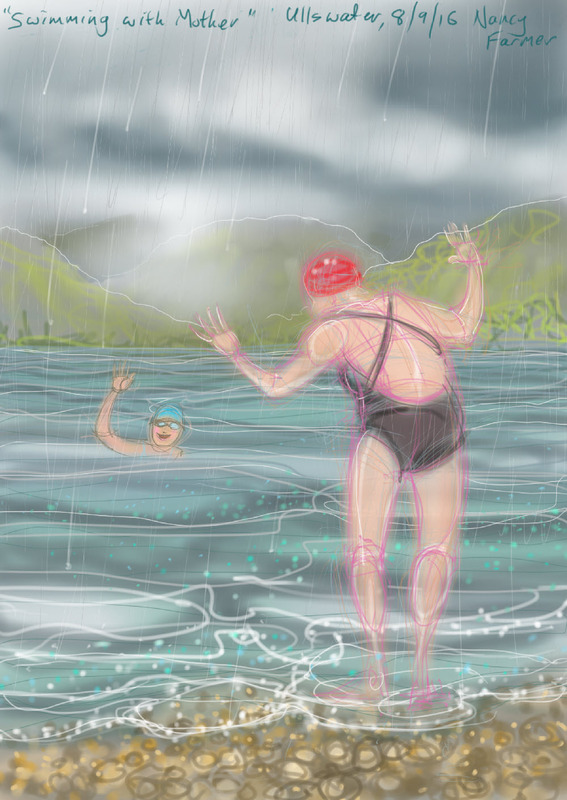 This entry was posted in Events, showcase, swimming and tagged art, Chillswim, chillswim tow float, Coniston end-to-end 2016, Coniston lake, Cumbria, drawing, Lake District, open water swimming, swimming in the rain on September 5, 2016 by Nancy Farmer. Vobster, yesterday. It was indeed fine weather for ducks. Fortunately there we were to take advantage of it: a flotilla of five rubber-clad ducks. Two of us training for Coniston-end-to-end, three for the Dart 10K; both end-of-the-summer long swims, though I have to say I think that the summer may have ended early. It’s not like we weren’t going to get wet anyway, but cross your fingers if you would, for a bit of sunshine the weekend after next! 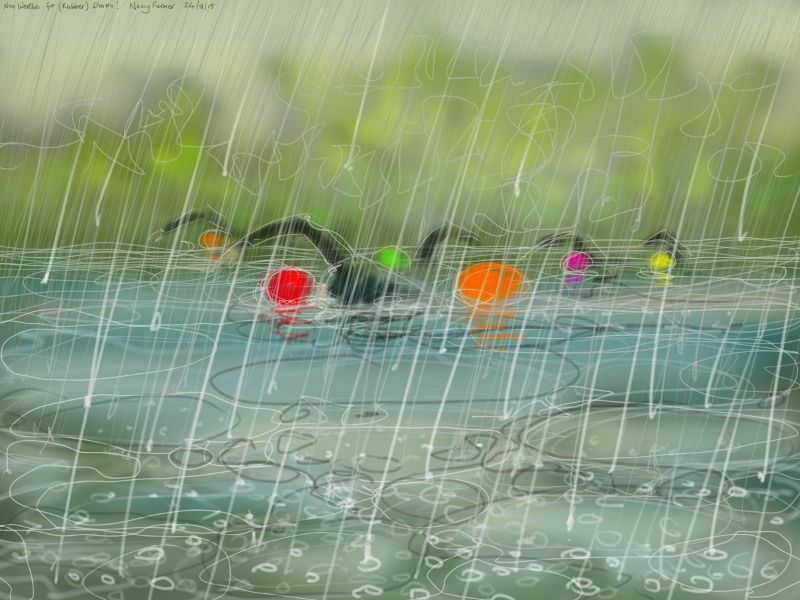 This entry was posted in swimming and tagged art, drawing, open water swimming, rain, sketch, swimming, swimming in the rain, Vobster Quay, wetsuit on August 24, 2015 by Nancy Farmer.